Built inside of a top quality composite reflector housing by Oracle Lighting, the Dodge Challenger Halo ights with easy external installation feature are durable and can last for years to come. The Oracle Halo lights feature waterproof heavy-duty rings that completes the headlights. The Dodge Challenger Oracle Halo Kit is designed to fit any Dodge Challenger headlights, as specified by the Camaro year. The color-changing LED effects of ColorShift offer you the choice between several different colors, and you can switch between them using the Oracle 2.0 remote control (a $100 value) that is included with the Dodge Challenger Halo lights. To make the Dodge Challenger LED halo glow, you won't need any sort of external inverter or regulator to do so, everything comes in the box. With the Dodge Challenger Halo Fog lights by Oracle, you are given a vibrant and striking way to light up your fog lights in a way that is protected by an IP67 waterproof rating for an easy external installation. Perfect for any weather, the Dodge Challenger LED fog light kit comes with the ability to mount them directly to the surface of your fog lights for simple installation. The Dodge Challenger fog lights come with quick-connect wiring adapters that help make installation a breeze, but we recommend seeking professional installation. The authentic 3M VHB adhesive backing of these Dodge Challenger LED fog lights forms a tight bond onto the lights and installation requires no cutting or baking. Make sure to wipe down and clean thoroughly, removing any grease or dirt off of the headlight and/or fog-light surface. Use a 3M adhesion promoter to swab at the lens where you intend to place the halo ring. Remove the top paper layer from the back of the halo. Feed the wire into the engine bay that is found toward the top of the light. Apply some pressure to keep the halo ring pressed onto the light until a sturdy bond has formed. Repeat this process for the rest of the headlights and/or fog-light. Change the way your Challenger grabs attention at night with these Dodge Challenger LED side markers by Oracle Lighting. These Dodge Challenger LED Oracle Side Markers offer laser light brightness that will certainly turn heads on any street you drive on. Designed as direct replacement with the LED option of the factory side markers, taking only five minutes to install. The Dodge Challenger side markers offer Bridgelux 2835 LED bulbs that provide sharp, clear lighting. Able to fit right onto any stock side-marker moldings, the Challenger LED Oracle Markers offer a direct plug-and-play functionality that will have you set up in no time at all. These come in a white/clear finish or the smoked finish as they are tinted. Turn your front wheel inwards. Take off the three rivets that are found in the lining of the wheel. Pull back on the liner of the wheel to get access to the side marker. Remove the clips from the side marker by squeezing them. Let go of the stock side marker from the connector. Plug in the new Oracle LED side marker. Reinstall the three rivets on the liner of the wheel. Injected with resin in order to give them a sturdy IP67 waterproof rating for easy external installation, these Dodge Challenger taillights are the perfect way to make a statement every time you hit the streets. This specific option is designed only for the 2008-2014 Oracle Dodge Challenger, the LED Tail Light Halo set are for a surface mount, features direct to lens surface mounting that is made simple with the adhesion promoter and the genuine 3M VHB adhesive backing, included with this kit. There are quick-connect wiring adapters that make it simple for you to plug and play, and these Dodge Challenger LED taillights' wide voltage external LED drivers offer bright and vibrant color. 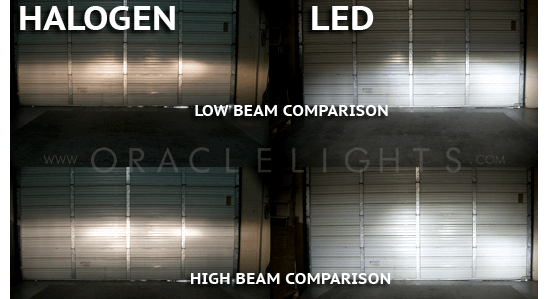 Replace your dimming Dodge Challenger Light Bulbs with this Oracle Lighting High Output LED Headlight Conversion Kit. This kit offers two high output LED bulbs that go above and beyond standard halogen lights. Each of the bulbs offers 4,000 lumens of light in order to provide maximum visibility and safety at night. The Phillips Luxeon ZES chips inside of the Dodge Challenger LED headlights offer excellent heat dissipation while naturally burning cooler and brighter than factory bulbs. Offering a crisper white light, the Dodge Challenger LED bulbs offer 6500K color temperature, carry a durable IP65 waterproof rating and are shock proof and dust-proof. With the Oracle Lighting High Output LED Fog Light Conversion Kit, you can have your fog lights burning brighter and cleaner than ever before. These replacement Dodge Challenger LED bulbs bring out 4,000 lumens of light, offering you greater nighttime safety and visibility than ever before. There are Phillip Luxeon ZES chips inside of each of these Dodge Challenger light bulbs that help to disperse the heat evenly. The Oracle Lighting High Output LED Headlight Conversion Kit offers 6500K color temperature and has a waterproof rating of IP65. The bulbs are resistant to both dust and shock. Add charm and excitement to your Challenger from the inside out with the Oracle Ambient LED Lighting Footwell Kit. These Dodge Challenger interior lights provide you with striking, yet non-distracting interior footwell lights so that you can customize your entirety car. In the Dodge Challenger LED interior lights kit, you get two strips of pre-wired, 15-inch sections: one for the passenger seat and one for the driver’s seat. The strips are ultra flexible and can be put in virtually any position you wish. Since they are waterproof, you won't have to worry about rainwater or wet shoes damaging them. The kit is complete with authentic 3M adhesive that makes for a simple installation. Able to be cut to any length, these strips use a low power consumption of 12 volts. Show off the beauty of your car right down to its engine with the Dodge Challenger Oracle Engine Bay LED Lighting Kit. These engine bay lights are ultra bright and stunning, offering you a clear look at your engine bay whenever the mood strikes. The SMDs of these Dodge Challenger engine dress up lights are ultra high quality, and there are more LEDs per section than ever before. Each one of the LED strips is sealed with a top-quality silicone instead of epoxy to ensure that there is no fading or yellowing with the heat of the engine. Roll down the highways and side streets in style using the Dodge Challenger Oracle LED Illuminated Wheel Rings. These Dodge Challenger wheel lights will add color and vibrancy to your wheels. Made to fit around the brake rotors of your car, the Dodge Challenger Oracle LED Illuminated Wheel Rings will light up the rim's barrel, thanks to its high quality Oracle LED Flex Strip. The rings will fit on wheels up to 15.5 inches in diameter and are able to withstand high temperatures with ease. All of the mounting hardware is included.